“HOME”, an international photographic project in which “the universal meaning of what home is, should, or can be is challenged or accepted” has come to fruition after six months of growth. Now an exhibition of the project is about to launch! The project, organized by the ex-Artis Cultural Association in Cyprus, started as a five-day residency in a village in Pafos (Cyprus) on the 27th June 2017. Twelve photographers from different countries-cultures had the opportunity to participate a photography workshop introduced by two tutors: Jason Eskenazi (USA) and Achilles Nasios (Sweden). The aim was to develop a discussion on the concept ‘home’, get inspired and redefine the idea of ‘home’. After the residency all photographers continued producing photos at their places of origin based on the same idea for the next three months to complete their project. The project was created to develop an interactive conversation around the concept of ‘home’, which would lead to an introspection and activation of artistic action. 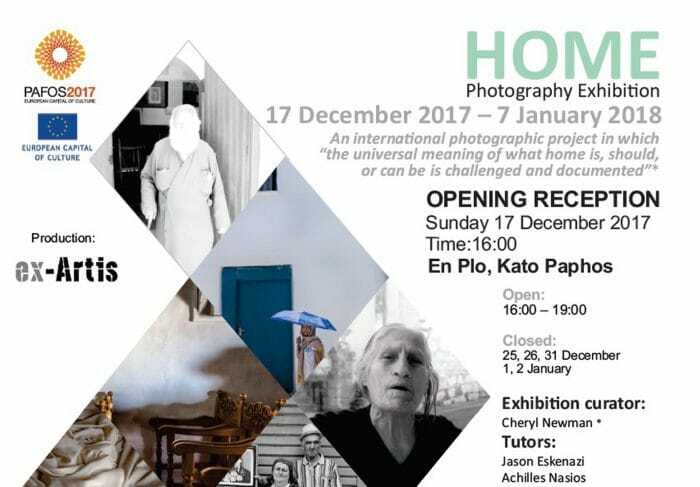 It is a project that aims to examine and present the different interpretations that the “Home” concept can have through the artistic collaboration and coexistence of photographers-artists and experts from Cyprus and abroad. Now the photographs from the Home project will be featured in an exhibition and catalog. The show runs from December 17, 2017 through January 7, 2018 at En Plo Kato Paphos. The opening reception will be on December 17 at 4:00PM. The exhibition is curated by Cheryl Newman (UK). The project coordinator is Thanos Savvidis (Cyprus). 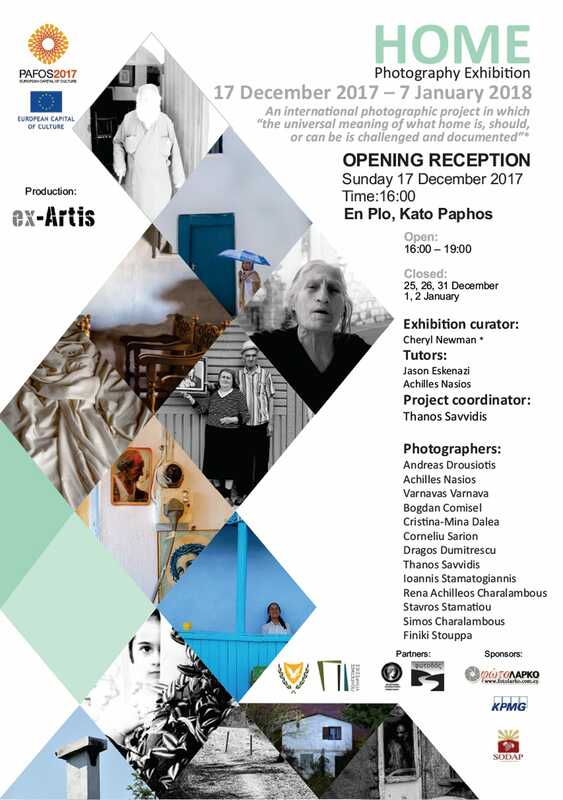 The twelve photographers participating are: Andreas Drousiotis (Cyprus), Varnavas Varnava (Cyprus), Bogdan Comisel (Romania), Cristina-Mina Dalea (Romania), Corneliu Sarion (Romania), Dragos Dumitrescu (Romania), Thanos Savvidis (Cyprus), Ioannis Stamatogiannis (Greece), Rena Achilleos Charalambous (Cyprus), Stavros Stamatiou (Greece), Simos Charalambous (Cyprus), Finiki Stouppa (Cyprus). The exhibition is part of the Official Programme of Events of the European Capital of Culture – Pafos2017 and the project is funded by the Cultural Services of the Ministry of Education and Culture.